Earlier this month, we reported that Taiwan's WiseChip is entering the OLED lighting market with plans to produce candle-light emitting OLEDs using technology developed at Taiwan's National Tsing-Hua University. Wisechip already started to produce sample panels, and the first ones were setup in an aboriginal village as street lights - embedded inside a bee-hive like mask taken from rotten wood. 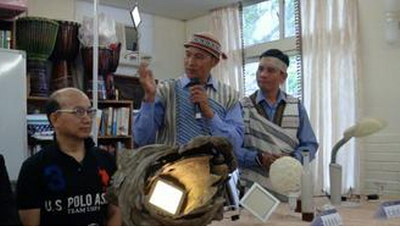 This tribe, Tai-Yah (also called Atayal), has been without electricty until 1979 (they were known as the "dark tribe"), and currently the use CFL street lights, but rejected a suggestion by the government to install LED lights. The tribe wanted street lights that will be not only human-friendly, but also ecology-friendly. One of the reasons they rejected the high-brightness LEDs is that they found too many dead insects underneath them. LEDs emit over 3 times more blue light than OLEDs, and blue visible light is widely acknowledge to have harmful effects - and was recently found to attract flying insects. WiseChip's panels emit light in a vision friendly CT of 1,914K and a high CRI (93). WiseChip aims to start OLED lighting mass production towards the end of 2014 or in early 2015. They say that these OLEDs do not emit high Kelvin blue light which is hazardous to eyes and also carcinogenic. Professor Jwo-huei Hou from National Tsing-Hua University explains that the blue light emission in both LEDs and OLEDs varies with the color temperature. OLEDs can easily be made with no blue emission. This is more challenging to achieve (if not impossible) with LEDs as they are mainly based on blue LEDs. 1. You cannot create white light without using the blue part of the spectrum. If you only use red and green the best you end up with yellow IRREGARDLESS of the technology.This should be basic knowledge. 2. It is also impossible to achieve a good CRI without the blue part of the sepctrum, because you need it to correctly render blue colours. If you neglect these points, then you can also easily make LED lighting without blue light: Just use red + green LEDs...for sure the color will be horribly yellow, the efficiency will be bad and the lightoutput low, but that is exactly the same with this candle-light OLED concept. Or you simply use a blue LED with enough phosphor to convert all the blue light. The result will be the same, but it will be even easier. Honestly just about the only thing that is correct in the article is that the blue light emission varies with colour temperature independent of technology. IRREGARDLESS of your knowledge or lack thereof of lighting, I would like the world to remember that "regardless" and "irrespective" can each be used individually and do not need to be mashed into this portmanteau.